If there’s ever been a piece of equipment ideal for what we do, it’s the digital handheld recorder. At every turn there is a need to capture high quality audio: a pastor’s lesson for radio or a web site blog, praise and worship band music, interviews and testimonials, and most likely at the top of everyone’s list, the Sunday morning worship service. For a few years now I’ve owned more than one handheld digital recorder and I’ve been very well pleased at the quality of audio they’ve yielded. I’ve used them mostly for interviews to create podcasts. We old radio guys who once wielded clunky gear for far inferior results still stand in amazement of just how great recordings can be using digital equipment so lean. No gripe here with the audio on any small recorder I’ve used which quickly turns the discussion, in my opinion, toward a unit’s features. For the past several months I’ve lived with the Sony PCM-D50 which is street priced around $500, a third of the price of the $1800 Sony PCM-D1 which I experimented with at last year’s Summer NAMM in Nashville. Sweet. The lesser priced unit is unquestionably great gear with an extremely strong feature set. Here’s what I like about the PCM-D50. • It is easy to use. I never had to read the instruction manual to record and playback great audio. • It looks and feels like a professional recorder with aluminum housing and granted, plastic knobs but the point is, it is sturdy and well-designed. • The main features are a button away – no intense scrolling through pages of screen dialog required. • Dedicated record level knob – that’s a really nice, often-missing feature with these types of recorders. Others have buttons that when pressed or clicked make noise that shows up on the audio. • Great built-in electret condenser microphones. The PCM-D50 is superior to other such recording devices in this regard, in my opinion. The complaint, however, is that these mics are prone to wind noise but the sound quality trumps that manageable annoyance. (Sony sells a furry windscreen for this unit for about $50. You could make your own.) The mics can easily be directed into either a 120-degree position that creates a wide stereo field suited for recording concerts or a 90-degree position that’s conducive to recording a single audio source, like a person speaking. The mic guard keeps them from being unintentionally redirected. • Replaceable batteries. I’m from the old school. I want batteries I can replace because sometimes I fail to turn it off and it’s DOA at my next event. Imagine. And sometimes I’m no where near a charger. Some other small recorders on the market have built-in batteries but it’s nice to be able to exchange batteries when necessary. While I didn’t test this out, this unit is heralded for its long battery life with some user reports indicating that it can record up to 14 hours on four AA batteries. • Auto microphone switchover. Little things can cause the biggest aggravation but the PCM-D50 eliminates a common complaint in that it switches automatically from internal to external mics when a mic is plugged into the unit. No scrolling down dialog pages to make that adjustment. Nice. • 4GB internal memory which is enough to record about 6.5 hours of 44.1 KHz/16 bit stereo audio. • Track divider button which allows a new WAV file to be created without stopping the unit. • Subtle but important features include solid-state memory and a backlit display. Also, the PCM-D50 is designed with four separate circuit boards to separate analog audio, digital audio, digital recording and power supply circuits which help minimize noise. • Sony memory sticks are of course compatible, and not any Sony Memory Stick mind you, but the Pro Duo and Pro-HG Duo. As mentioned, the unit has a 4 GB hard drive which is more than adequate for most recording needs. However, SanDisk also makes memory sticks which are compatible with the PCM-D50. • No independent controls for left and right tracks. Even when I’ve had separate controls on other units I’ve had to normalize and fix level issues in post production – not a big deal. It would be nice to have independent track controls though. • The PCM-D50 has a USB miniport and 1/8” remote, microphone and line-in inputs. (A XLR-1 optional adapter is available.) On the plus side, the line-in and line-out connections are offered in analog and optical. That’s a nice feature and being relegated to 1/8” instead of XLR or 1/4 inch doesn’t bother me – I can get the audio into the recorder without sweat. • This recorder has no provisions for phantom power. The unit isn’t as small as some of its competitors. It really isn’t a “pocket recorder” (unless you wear overhauls) but it is built sturdy and looks as professional as it is. With a USB connection, when connected to a computer, the device will appear as a hard drive on your desktop and you can easily drag the WAV file from the device to your computer. It would be the perfect recorder to capture the final audio out from the sound mixer for a Sunday worship service, and it would certainly prove to be a workhorse in other venues as well. 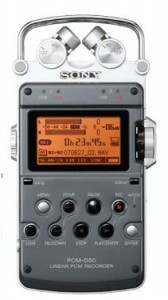 Bottom line: The Sony PCM-D50 is an excellent digital recorder that in many ways exceeds its competitors and would serve your all-terrain recording needs well.